Honey Beaulieu grew up in her mama's whorehouse, the Tasty Chicken, which serves up the finest food, whiskey, and women in Wyoming Territory, but Honey takes after her crack shot Pa--and she doesn't back down from anyone or any thing. 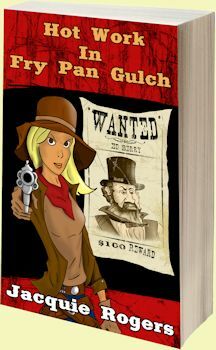 Determined not to make her living on her back, Honey does her best to keep the peace in Fry Pan Gulch, but a deputy's salary won't buy her a home. Once she's adopted by a donkey and then a pickle-eating mule, she sets out to collect a bounty on one of the town's scoundrels. The owlhoot leads her on a dangerous chase. Can Honey persevere despite a wise-cracking ghost who manages to disappear when she needs him, and a handsome U.S. deputy marshal who doesn�t seem at all put off that she's so scrawny?